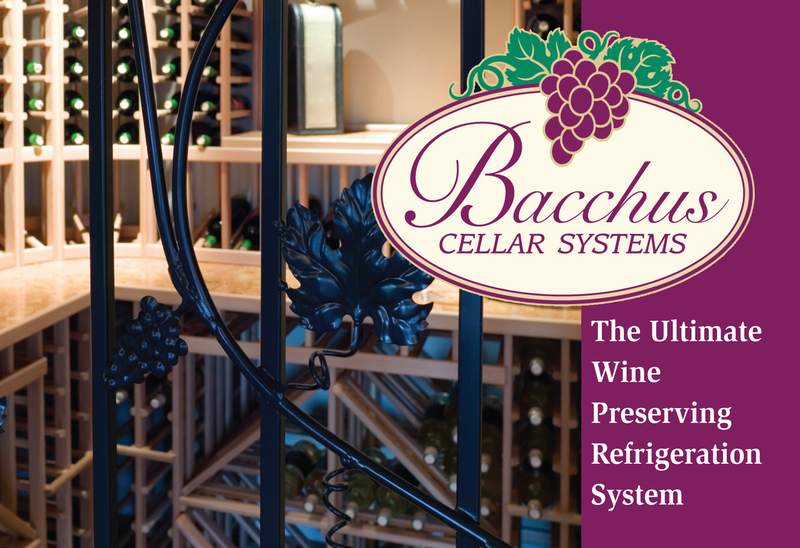 Bacchus Cellar Systems integrate exact temperature control and optimal humidity (50-70% RH) along with a streamlined, stainless steel ceiling mounted evaporator with a low noise double tangential blower. Its patented temperature/humidity control allows for a constant supply of optimal cellar conditions. This split system concept places the condensing unit away from the living space and moves the compressor and fan noise to a less obtrusive location. One quiet evaporator fan produces maximum air flow with the lowest decibel output possible. Other competitive systems might use modified mini split wall mounted evaporators that are not aesthetically pleasing and take up precious bottle space, just like their through-the-wall room air conditioner counterparts. Two models, ceiling mount or ducted styles handle any cellar up to 1500 cubic foot, and dual evaporator models up to 3000 cubic foot. 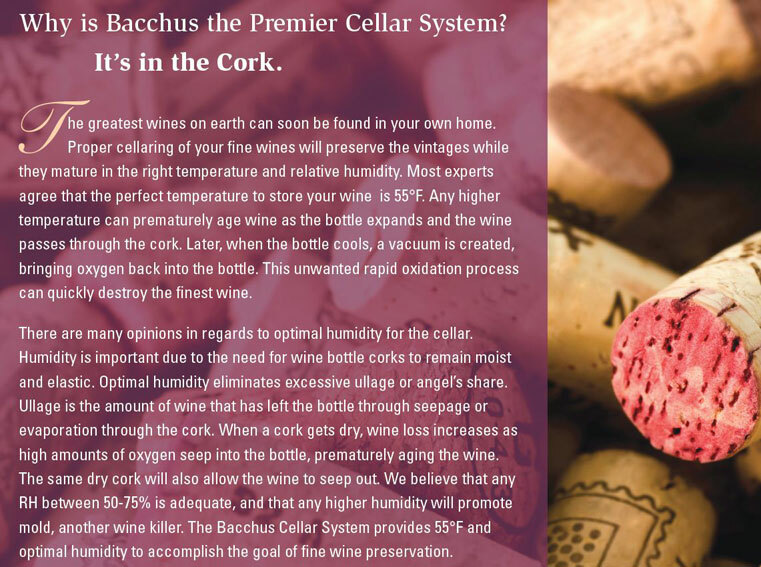 Bacchus Cellar Systems integrate exact temperature control and optimal humidity (50-70% RH) along with a streamlined, stainless steel ceiling mounted evaporator with a low noise double tangential blower. Its patented temperature/ humidity control allows for a constant supply of optimal cellar conditions. This split system concept places the condensing unit away from the living space and moves the compressor and fan noise to a less obtrusive location. One quiet evaporator fan produces maximum air flow with the lowest decibel output possible. The stainless ceiling mounted evaporator is attractive, simple to service and frees up wall space for valuable redwood bottle racking. Our ducted evaporator utilizes a larger blower, and is completely out of sight. The BCS Digital Microprocessor is very accurate and will give the owner confidence that the temperature and humidity of the cellar are in the optimal range. An optional communication module can monitor the system from anywhere in the world, and will signal alarm conditions. An internally powered control board in the chilling unit controls the condensing unit, fans, pump, and water supply solenoid. A simple control circuit runs from the chilling units microprocessor to the dual temp/humidity digital keyboard, and to the control sensors. Refrigerant lines, water supply, condensate line, and electrical power are not visible as they enter the ceiling mount chilling unit through the ceiling, and are completely concealed with the ducted system. Why is Bacchus the Premier Cellar System?